Almost half of sub-Saharan Africa live on less than $1/day ABUJA (Reuters) - United Nations Secretary-General Kofi Annan has told African leaders they are failing to meet targets for reducing extreme poverty and combating killer diseases five years after agreeing to global development goals. Annan urged heads of state at an African Union summit in Abuja to make 2005 a turning point, saying the technologies needed to battle the continent's woes already existed. The Millennium Development Goals, agreed by all nations in 2000, include halving the 1 billion people living with poverty and hunger, reversing the spread of AIDS and malaria and providing basic education by 2015. "Africa is not currently on track to achieve the Millennium Development Goals," Annan told the summit's opening session in the Nigerian capital on Sunday. "It lags behind other parts of the developing world ... It continues to suffer from the tragic consequences of deadly conflict and poor governance." Almost half the people in sub-Saharan Africa live on less than $1 (53 pence) a day, about one in five children die before the age of five and a third of the total population goes hungry, according to latest U.N. statistics. Poverty and disease have thrived on Africa's wars in Congo, Liberia and Sudan. But even Nigeria, with its huge oil wealth and relative stability, is struggling to show progress in indicators such as child mortality and literacy. African governments can turn the situation around in time for the 2015 deadline, Annan said, by following a series of recommendations contained in a new U.N. report including removing charges for primary health care and schooling, and distributing mosquito nets. Rich nations can also help by providing more aid and cancelling debt. "Most of the report's recommendations have Africa clearly in mind," Annan said. "Africa need not wait for tomorrow's breakthroughs to address today's problems. Basic technologies available today can begin to do the job." The United Nations will hold a summit in September to review progress towards the targets in the last five years, but it is clear that Africa, which has a disproportionate share of the world's poor, is not making the grade, he said. 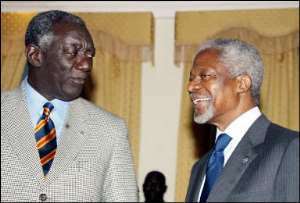 "Africa has an indispensable contribution to make in ensuring that 2005 becomes a turning point for the continent, the United Nations and the world," Annan said. Britain kicked off its presidency of the Group of Eight nations this month by pushing a three-point plan for Africa comprising debt relief for the poorest nations, a doubling of aid to $100 billion and crushing trade barriers.